Following links from a student's wiki project, I came across this post by the one and only R.U. Sirius, cyberboho and former editor of Mondo 2000. I hope the performance piece he mentions, Case, leads to interest in a film. The Internet Movie Database has rumors of a 2011 movie. Gibson started all this craziness for me. We thought the book so cool in grad school, with our black sunglasses and, tucked into our leather jackets, battered copies of Gibson's novels. That seems eons ago. Yet the novel sticks with me; I came to Second Life partly, as my in-world profile shows, to see if he was right about virtual worlds. Gibson has stopped writing science fiction these days, mostly, as I heard him explain to an NPR interviewer, because reality has caught up with him and surpassed his early visions. And what visions. While we don't yet have "Microsofts" to plug into jacks behind our ears, razorgirl meat-puppets turned street samurai, orbital AIs that make artwork, or Rastas in abandoned space colonies, we do have a lot of Gibson's fearful future with us: soulless corporations with slick-as-glass slaves who work for them, governments in shambles, a climate-crisis, global terrorists. Yet I don't call his future "dystopian" as much as "detached," in the same way hard-boiled detective fiction can feel. Neuromancer's world scares students with its steely-cool hipness. Despite my misgivings after the awful mess of bringing "Johnny Mnemonic" to the big screen, this new project might spawn something better. 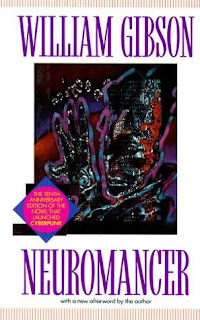 My mind, like a television tuned to a dead channel, awaits the arrival of Neuromancer. I cannot remember how often I have read it (as well as Burning Chrome, Mona Lisa Overdrive, Count Zero ...). This man has shaped my life as a geekette. And I think its a loss that he doesn´t write in that genre anymore. If there is a movie coming up, I hope that it will stick to the 1980 atmosphere and doesn´t become too modern which would be desaster in my eyes.